Photos from last week’s graduation at the Grace Brethren High School in Simi Valley, Calif., are included in this week’s Simi Valley Acorn newspaper. One appears below. Click here to view others. The high school is a ministry of the Grace Brethren Church, Simi Valley, Calif. (Jordan Bakker, pastor). Click here to read a story about senior standouts at Grace Brethren High School, from the Simi Valley Acorn. 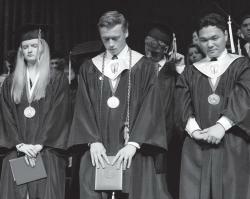 Grace Brethren High School chaplain Don Carlson, center, bows his head as the class prays at the conclusion of their commencement ceremony on Fri., May 31. Additional photos were included in the Ventura County Star. Click here to see the complete photo gallery.